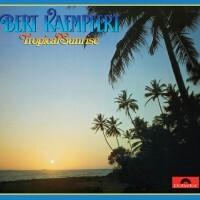 After the great success of THAT LATIN FEELING, Bert Kaempfert then produced a further album entitled TROPICAL SUNRISE in 1977, which is again devoted exclusively to Latin-American rhythms. Accompanied by exquisite harmonies and instrumental sounds, listeners are once again transported to exotic regions. On this production, however, compared to the earlier one dominated by dance rhythms, we can hear a larger orchestra and arrangements documenting the continual development of Bert Kaempfert’s special sound. He hired the famous percussionist Nippy Noya for the South American percussion instruments, backed by Rolf Ahrens on the drums and by Max Raths, Hans Bekker and Manfred Sperling. And so we can hear instruments such as the apito (whistle), bell tree, cabaza, claves (pair of hardwood sticks), conga, cowbells, cuica (friction drum), jaw bone (a donkey’s jaw bone), pandeiro (tambourine), reco-reco (scraper), timbales and triangle. The solos are performed by Herb Geller (flute), Ack van Rooyen (trumpet), Jiggs Whigham (trombone) and Jürgen Schröder (guitar). This production contains six numbers composed by Bert Kaempfert and Herbert Rehbein. The song Footprints In The Sand even received an award in Argentina. In addition, evergreens such as Andorinha Preta (Brazilian Love Song) or Island In The Sun – sung by Harry Belafonte in the film of the same name in 1957, famous in Germany as Wo meine Sonne scheint with Caterina Valente – were also included in the compilation. Titles such as Wave, a hit by Antonio Carlos Jobim, composer of Girl From Ipanema, or Canto de Ossanha by the legendary Brazilian guitarist Baden Powell added a ‘modern touch’.